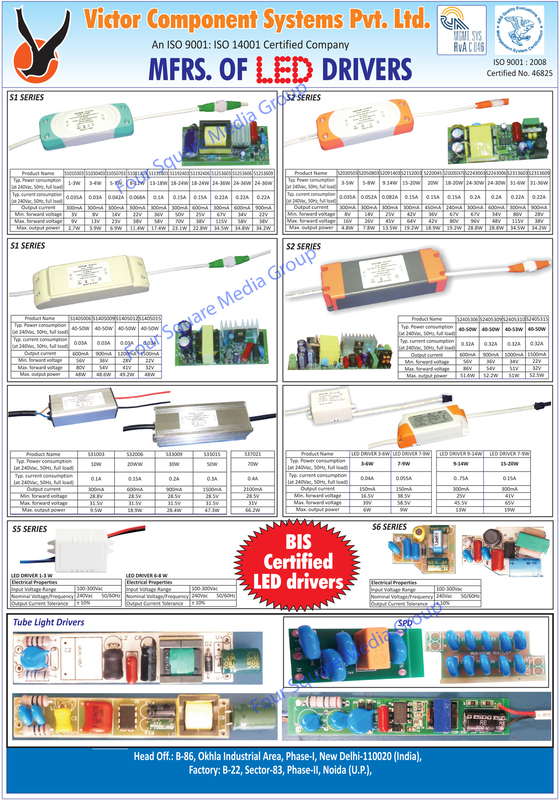 Led Drivers, Tube Light Drivers, Led Light Drivers, SPD Drivers as an active Manufacturer, Supplier, Dealer, Distributor, Trader and Seller etc. (*Importer/Exporter/Service Provider). The company manufactures quality OEM wounded magnetic Components like Ferrite Core Transformers for high Frequency applications . Torroid Coils for EMI filter , Inductors , Linear Transformers for 50-60 Hz supply , AC/DC adapters ( unregulated and regulated ) types Smps/Linear power supplies for consumer electronics , telecommunications , computers , electronic energy meters and LED Drivers . Victor Components has also promoted a separate company , Victor Pushin Cords . Pvt. Ltd to manufacture a range of Cables , Power Cords and Wire harnesses for applications in electrical and electronic equipments .